The Bedford (Amateur) Musical Society, now Bedford Choral Society, was formed in 1867. Its beginnings were not auspicious – an article in a local newspaper reported that ‘no one felt very sanguine about the success of the proposed Society … the idea being that musical people were a quarrelsome lot and could not hold together for any length of time.’ Despite this, the Society has had a long and almost continuous history and is still thriving today. This volume records the characters who shaped the Society through the years, the varied musical programmes and the links with well-known performers and musicians. It includes the BBC Music Department’s move to Bedford early in the Second World War and its support for the Society as it re-established itself. 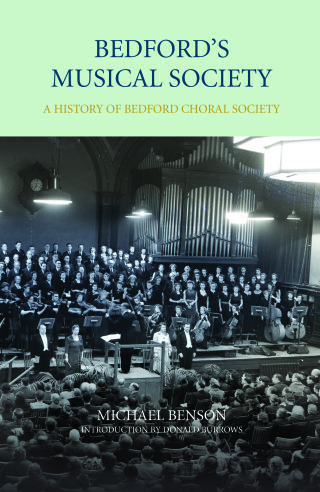 The volume has an introduction by Donald Burrows, Professor of Music at the Open University who provides an historical setting for the development of the Society within the context of national musical developments. Donald Burrows is Professor of Music at the Open University and a leading scholar of the music of George Frideric Handel.